When Mark Hopkins (12) visited the Johannesburg Hospital School for Autism in Braamfontein as part of a volunteer group, he was struck by the desire to help even further. The school offers cutting-edge education to severely autistic children but must make every cent count, as it is a government school with a large proportion of learners from grant-dependent families. 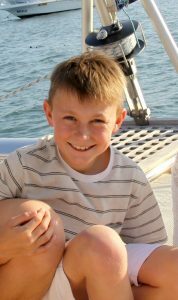 Mark, who is known as a compassionate child, had previously encountered autistic people and understands the condition well. Mark’s father, Guy, is managing director at Trollope Mining Services. The company hosts an annual mountain bike challenge, the Lesotho High Altitude Challenge, and donates the sponsorships that the cyclists raise – along with generous donations from the company’s suppliers, sub-contractors and clients – to charity. This year, due to Mark’s prompting, the company’s charity scouts visited the school and decided that it should be one of two recipients for the annual charity drive. As it happens, the school asked not for assistance improving their building, but for something they have desperately needed for some time – a bus that will allow teachers to take the learners on outings where they can learn the skills that other, more able-bodied people take for granted. These skills include how to greet shop assistants and ask for help; how to choose items and pay for them in a supermarket, and how to negotiate the enormous potential confusions, for a severely autistic child, of using an public bathroom. These simple activities can cause such anxiety in autistic children that they have a complete meltdown. Learning to negotiate public spaces is crucial for the future of autistic children in society, and also to enable their families to function as ‘normally’ as possible in their own communities. By tradition, Trollope Mining Service’s Lesotho High Altitude Cycle Challenge mainly raises money for disadvantaged disabled children. This year the cycle challenge was taken to the next level with a new, very tough ‘ xtreme’ route covering 300km, over longer distances and even rockier terrain than in previous years, and reaching an even higher altitude. The result was that enough money was raised enough money to buy the school a brand-new 22-seater VW Crafter Bus, costing over R600 000. The bus was presented to the Autism School at a company function in May. “We have been fundraising for the bus for some time, and are overjoyed to be receiving it,” said the school’s principal, Ronel van Biljon. “It is going to make an enormous difference, in hundreds of our learners’ lives. Mark was named Pupil of the Month at his school for “recognising that there were children in need who would benefit from a charity drive”, and opting for the Johannesburg Hospital School for Autism. “I feel great that I helped a school with something that will benefit the children every day – and will also help give the children a better future,” says Mark.